Unite the raw data storage capabilities of OnApproach with the reporting power of BankBI and gain new insight into financial performance. 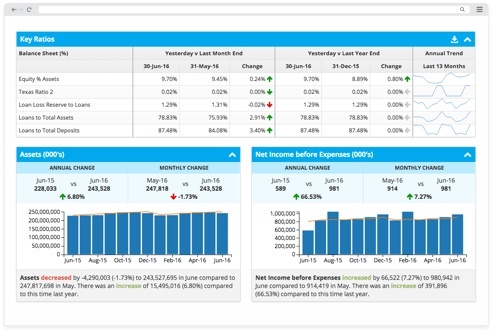 Using data pipelines that read, process, and load data into high-value dashboards, receive an up-to-date overview of your credit union and identify opportunities and monitor trends with daily reporting. Automate data extraction processes and perform powerful analysis. Drill down into any KPI, balance sheet, or income statement line using analytics software. Break away from inaccurate, labour-intensive account mapping. Automate chart-of-accounts production and facilitate the integration of budgets at a branch level. Remove the risk of month-end adjustment irregularities, such as back-valued transactions, fee amortisations or monthly costs with comprehensive, end-to-end data extraction. Unite credit card, student loans, and third-party data in a single source of truth and experience unparalleled banking data analysis from powerful financial applications. Gain accurate, up-to-date insight into financial health by moving away from manual weekly or monthly reports to an automated daily reporting cycle. Remove key person dependencies, reduce risk, and increase speed-to-value by automating all reporting processes and eliminating data population errors. Relieve acquisition headaches during core banking migration and alleviate the pressures of merging disparate financial management accounts by using BankBI to map two or more chart-of-accounts into one single unit. Utilising intuitive applications, OnApproach users can focus resources on transition activities, smooth reporting processes, and provide continuity to finance and accounting teams, without the pressure of creating new reporting packs. Using BankBI, credit unions can simplify merger activities and ensure high-value reporting continues uninterrupted. Maximise the value of a core banking transformation and retain irreplaceable historical data by implementing BankBI before and after migration. Using specialised reporting software, OnApproach users can process, load, and store chart-of-accounts data into dashboards pre-migration, then effortlessly switch to a new chart-of-accounts post-migration, retaining all existing data. Using BankBI, credit unions can simplify the storage of years of management information history and streamline the core banking migration project.